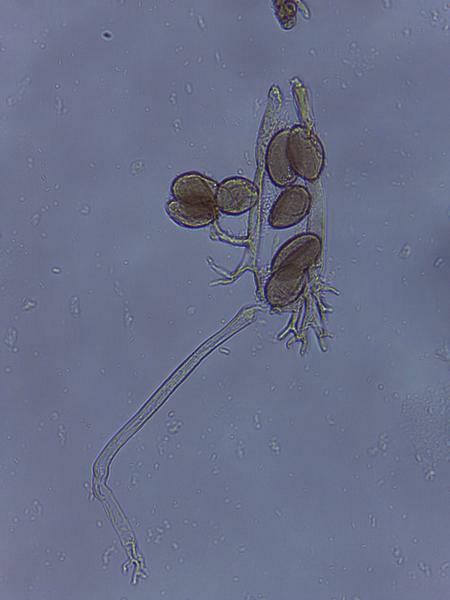 Hop downy mildew is caused by the fungus-like oomycete pathogen Pseudoperonospora humuli (Figure 1). P. humuli is a specialized pathogen on hops and an obligate parasite that only can grow in living host tissue. Figure 1. Sporangiophore and sporangia of Pseudoperonospora humuli. The host is Humulus lupulus also known as hop (Figure 2). P. humuli can also infect japanese hop (Humulus japonicus). The pathogen is very closely related to Pseudoperonospora cubensis, the cucurbit downy mildew pathogen, but P. humuli will not infect cucurbit crops and P. cubensis will not infect hop. 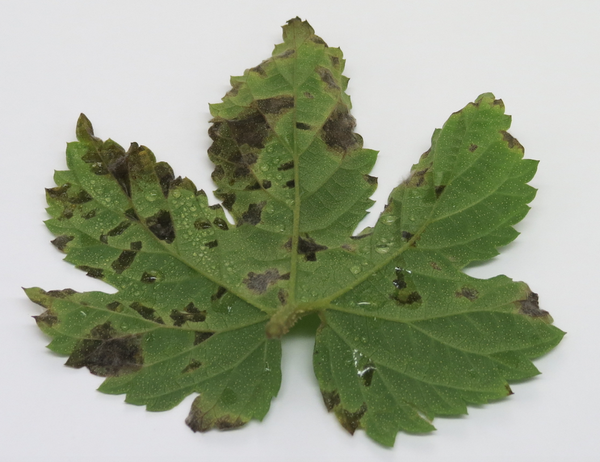 Downy mildew pathogens are highly host-specific. Figure 2: Hop plants grown in North Carolina. P. humuli survives the winter in dormant buds or crowns and grows into the tissue of the basal spikes as shoots expand. The pathogen can cause severe symptoms in leaves and cones reducing yield. A key characteristic symptom produced by the hop downy mildew pathogen are the so called "spikes" which are systemically infected shoots. There are three main types of spikes: 1) "primary spikes" which arise from infected hop crowns, 2) "secondary spikes" which arise from infected apical meristems, and 3) "aerial spikes" which occur on lateral branches or trained vines. Shoots showing primary spikes are stunted with shortened internodes and pale green leaves that are brittle. Secondary spikes show similar symptoms compared to the primary spikes but the internodes are not as shortened. Shoots with primary and secondary spikes become fragile and desiccate during dry weather. Aerial spikes compromise the development of the plant causing the bines to fall away from the string. 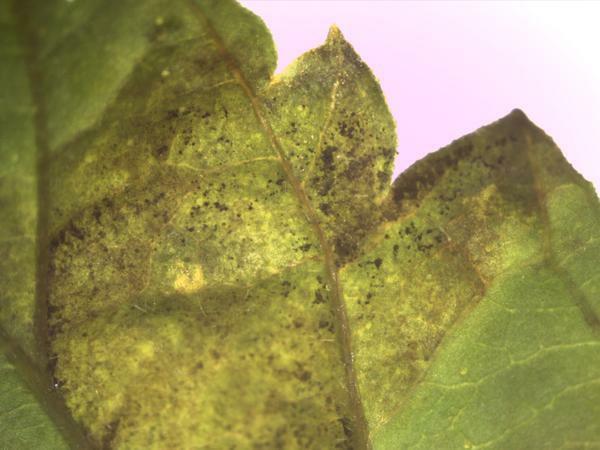 Leaves that are infected appear purple-gray to black downy growth (Figure 3 and Figure 4). Cones that are infeced become brown, harden and are affected in their development (Figure 5). Sporangia are formed in mass in the underside of infected leaves and under infected leaf-like structures within the cone such bracts and bracteoles. Figure 3. Heavily sporulating brown spot in a leaf infected with P. humuli. Figure 4. P. humuli lesions and sporulation on the underside of a hop leaf. Figure 5. Infected hop cones with P. humuli. High-humidity (~90%) and moisture (6-12 hours of moisture are ideal and usually occur as morning dew, rain or overhead irrigation). Mild to warm temperatures (~65°F) when free moisture is present for at least 1.5 hours, although leaf infection can occur at temperatures as low as 41°F when wetness persists for 24 hours or longer. In North Carolina, the disease can begin as early as May or June depending on environmental conditions and inoculum sources from plantings that used infected seed. Once established, the disease lasts throughout the growing season. Pathogen spores can be transported from state to state through air currents. The pathogen needs a living host to survive and spores come to North Carolina every year from infected plants in surrounding states. The pathogen can also be seed borne since it survives the winter in infected crowns and rhizomes. Plant pathogen-free seed and rhizomes. Plant tolerant varieties when possible. Check resistance profiles of hop varieties described at the North Carolina Hops Project. Avoid overhead irrigation, specially during and after burr development. Scout plants often and remove infected plants. Protect the crop with fungicides. Pull basal foliage during spring pruning. Application of fungicides is the most effective strategy to control hop downy mildew. Preventive applications should begin if the disease has been reported in the state. Also being applications if spikes are observed. Regardless of the product, it is important to apply them in a way that you achieve good coverage on both sides of the foliage, and that you apply the products before disease begins. Fungicides are most effective when applied in a preventive, weekly spray program. Alternate products to avoid generating fungicide-resistant strains. Fungicide labels are legal documents, always read and follow fungicide labels. For the latest fungicide recommendations for hop downy mildew see the Field Guide for Integrated Pest Management in Hops and Pacific Northwest Plant Disease Management Handbook for Hop Downy Mildew. Organic growers need to keep leaf and cone tissues protected by selecting downy mildew tolerant varieties and following cultural practices to limit downy mildew infection. Organic growers have less chemical options that are effective; the only OMRI labeled active ingredients that have some efficacy against hop downy mildew are fixed copper formulations. Products containing the active ingredients copper or chlorothalonil (the trade name of one product with chlorothalonil is known as ‘Daconil’) are the best and only effective products available to home gardeners. In addition, home gardeners should grow varieties with tolerance if they are worried about hop downy mildew in future years because most chemicals available to the home gardener are not sufficient to control hop downy mildew once it appears. The Extension Plant Pathology Portal provides information on crop disease management. The Field Guide for Integrated Pest Management in Hops provides information on hop disease management. The Pacific Northwest Plant Disease Handbook provides information on fungicides recommendations for hop downy mildew. 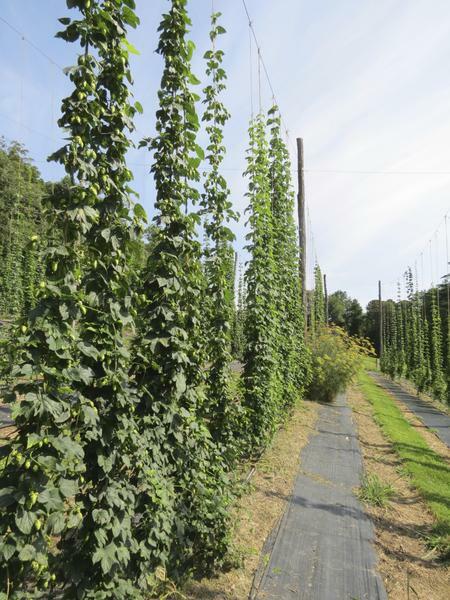 The North Carolina Hops Project provides information on hop research and hop varietal trial. The USDA Fungus-Host Distributions Database provides information about reported hosts for fungal and oomycete pathogens. This factsheet was prepared by the NCSU Vegetable Pathology Lab in 2017.